Australia is the region’s major power, but now there are signs of life from New Zealand. 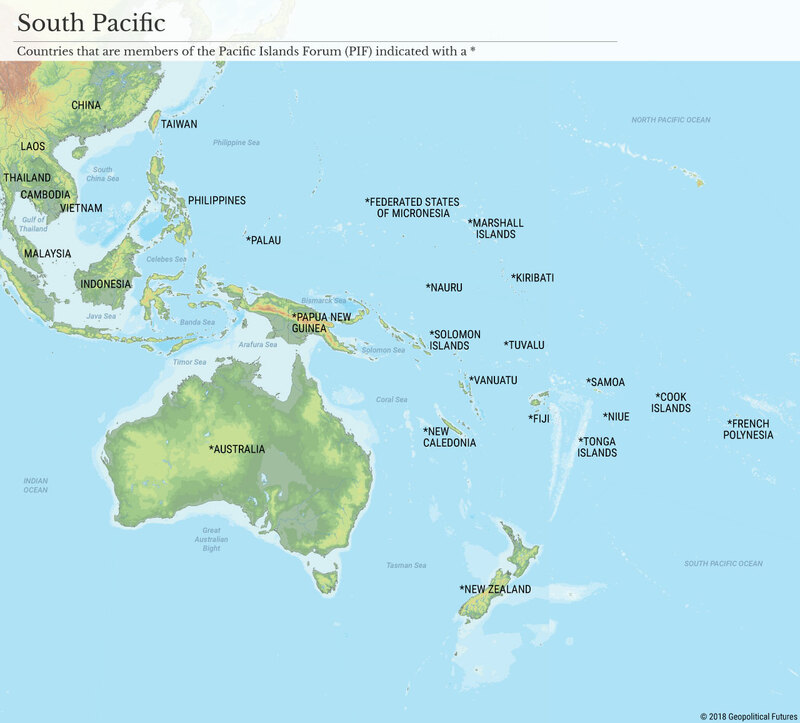 An overlooked multilateral organization in the South Pacific is about to get a facelift. Until now, relations between the members of the Pacific Islands Forum, which comprises Australia and New Zealand as well as 16 other Pacific island nations, have been defined by the Biketawa Declaration. Signed in 2000, Biketawa outlines how South Pacific nations deal with a regional crisis – and it served as the formal mechanism by which Australian and New Zealand forces were deployed to the Solomon Islands, Nauru and Tonga in recent years. Biketawa envisioned a post-Cold War world in which the biggest threats were internal. But the world has changed, and so must Biketawa. New Zealand’s Ministry of Foreign Affairs and Trade was the first to announce the move. On July 5, it said a new security agreement was going to be signed at the Pacific Islands Forum in Nauru in September. Australia’s international development minister added a little more detail, explaining to The Australian that the new pact would provide a better framework for South Pacific nations to respond to “emerging threats.” China has increased its financial aid and loans to South Pacific nations in recent years, but money is essentially the only lever China has at this point. Chinese naval forces are too weak and its political ambitions too intrusive to project power into the región. Australia is the major power in the South Pacific, but now there are also signs of life from New Zealand. New Zealand has always been the most distant of the “Five Eyes” – an alignment of the U.K., the U.S., Canada, Australia and New Zealand. It is by far the most insecure of the five, and that has always meant that New Zealand must be more pragmatic in its foreign relationships. By virtue of its size, New Zealand also simply has fewer resources to contribute. But even despite the occasional ups and downs, especially in its relations with the U.S. (e.g., it banned nuclear-powered or nuclear-armed vessels from its waters in the mid-1980s, a policy that is still in effect), New Zealand’s loyalty has never seriously been in question. That doesn’t stop people from questioning New Zealand’s fidelity, of course. A report by the Canadian Security Intelligence Service in May made waves when it suggested that New Zealand was the “soft underbelly” of the alliance and might host Chinese naval facilities in the future. The report was merely a collection of independent views that did not represent Canada’s official position, but that did not stop speculation from running rampant over New Zealand’s position. The report became so widespread that it elicited a response from New Zealand’s prime minister, who dismissed it as idle chatter. Then, at the end of last week, New Zealand released its Strategic Defense Policy Statement, and it left no doubt to where Wellington stands on China. The document criticized China for asserting its influence in Asia (and expressed concern about China’s expansion in Antarctica). China’s Foreign Ministry criticized New Zealand on Monday for that position, claiming that New Zealand should do more to build mutual trust in the region. Building trust may appeal to New Zealand’s sensibilities, but nice-sounding words don’t jibe with China’s militarization of the South China Sea and plays for influence in the South Pacific. While China was crying foul, New Zealand announced a much louder move on Monday with the purchase of four submarine-hunting surveillance jets from the United States for $1.5 billion. In the past week, then, we’ve seen the Pacific Islands Forum, led by Australia and New Zealand, indicate that its members will sign a new security framework to protect South Pacific nations from external threats. We’ve seen New Zealand release an official government report identifying China as a primary challenge to national security. And we’ve seen New Zealand take a step toward enhancing its defense capabilities by purchasing military aircraft from the United States. China has vast financial resources to peddle in the South Pacific, but its interests are inherently expansionist, while Australia and New Zealand’s interests are primarily defensive. That may be enough to keep the South Pacific aligned against China for now, but that is not the end of the challenge. It is the beginning.